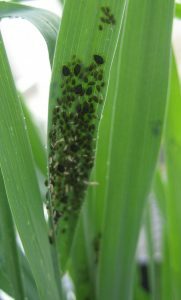 English grain aphid (EGA) appears in cereals, especially wheat, as grain begins to fill. Historically they have been reported as causing economic loss at 25 aphids per grain head. Newer estimates of EGA damage occur at 50aphids per tiller before and during the milk stage of grain fill. After the soft dough stage no economic loss occurs. There are multiple color variations that are usually present. Some are green, some are light green, some are red, and some are almost black in the same field population. Bird-cherry oat aphid can be a major pest of wheat and barley due to transmission of barley-yellow dwarf virus. They feed on multiple host species and movement between crops maintains populations of the aphid and virus. These pests often invade winter wheat from October to early December. Actual symptoms of barley-yellow dwarf virus appear in February. Predators such as ladybird beetles, lace wings, and Nabid bugs will typically keep aphid populations below economic thresholds. It is very rare to have aphid populations without predators feeding on it. Maintaining untreated refuges without insecticides may conserve natural enemies and contribute to natural control. For EGA, the cost of spray treatments will be often more that the dollar cost of damage if natural enemies are destroyed in the spray process. It is hard to pay for a spray with soft white spring wheat prices and obtain a yield increase. For the bird-cherry oat aphid, seed treatments with an aphidicide will help reduce populations. Foliar sprays are less effective. 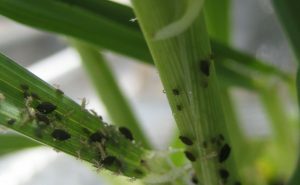 Treating bird-cherry oat aphid will help control barley-yellow dwarf virus.